Along with Mt. Kumotori and Mt. Odake, Mt. Mito三頭山 is one of the three famous mountains of Okutama. 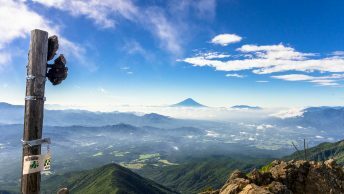 The mountain retains expansive areas of beech trees owing to the fact that the mountain was largely off limits during the Edo Period. While the main access to the mountain is via the Hinohara Tomin no mori 都民の森 on the opposing side of the mountain, this hike follows a route from Lake Okutama. At Okutama Station take a bus headed for Miyama 深山橋. Get off at the Ogouchi Jinja bus stop 小河内神社 (30 mins, 560 yen) alternatively you can go a few stops further to the Miyamabashi bus stop 深山橋 and hike along the Murokubo Ridge ムロクボ尾根. Either way both trails meet up at Mt. Nukazasu ヌカザス山 after a couple of hours of walking. From the Ogouchi Jinja bus stop, mosey across the Lake Okutama floating bridge 奥多摩湖の浮橋 which takes you to the Okutama Circular Road on the opposite side. Once you hit the road turn right and look for the trail head veering up to the left, about a five minute walk. The first section along the Nukazasu Ridge ヌカザス尾根 tracks through ubiquitous plantations taking around an hour to reach Mt. Iyo イヨ山 (979 m). The next section steepens as you approach Mt. Nukazasu ヌカザス山 (1,175 m). From here to summit of Mt. Mito (1,531 m) the trail has a noticeably sharper gradient with ropes available to steady your footing. With my hiking companion whom I met on route made it to the summit in a little under 3 hours though maintained a fairly steady pace. Views from the summit include Mt. Fuji and Mt. Kumotori though it is somewhat forested. With the wind having died down it also made for a good lunch spot with plenty of benches to kick back on. After lunch I headed down to the Mitosan Refuge Hut 三頭山避難小屋 which is spacious and well maintained. Nearby there is a watering hole around a 10 minute walk along the trail towards the Mito no Otaki Falls 三頭大滝. The waterfall itself is surprisingly high cascading some 33 metres and a suspension bridge allows you to get closer to the action. From the waterfall head along the tourist trail to the Tokyo Citizen’s Forest which is the entry point for most sightseers. The final section to the Kazumakami bus stop 数馬下バス亭 click here follows the river and eventually pops out on the Hinohara Kaido which you stick to downhill for a further 5 minutes for the trip back to Musashi Itsukaichi Station (1hr, 920 yen). Thanks for this post. I did this hike last week, Monday, Sep 14, 2015. I only saw two people the entire 5 hours, which was wonderful. The only thing I wanted to add as a caution to others is that the last bus from the Tokyo Citizen’s Forest leaves at 16:30 (maybe 16:45). I came out of there at 18:30 to an empty parking lot. I started walking along the highway–this after a five-hour hike–with no idea which way to go nor how far it would be. Luckily a young couple picked me up and drove me 40km! to the nearest train station. Good to hear you made it out safely! Though in future would definitely recommended verifying the bus timetables in advance and carrying a Yama-to-Kogen map as they show most of the main stops. Thanks for the post David and the excellent information – as always. After doing this hike yesterday, I just thought I’d add a little footnote here for anyone considering doing the hike in the reverse direction – i.e. Mito san to Okutama. The beautiful beech groves have a downside in winter in that all those lovely leaves end up on the ground. Coming down the steeper sections heading towards Nukazasu and Iyo, this makes the going very treacherous indeed as the leaves cover exposed roots, loose rocks and old branches. The leaves obscure the path, which is also extremely narrow in sections and quite eroded with steep drops on both sides. If you are heading down this way, allow plenty of time and ensure you have adequate daylight. Thanks for your wise words Adrian. Fallen autumn leaves certainly do hide potential hazards along with being slippery in the wet. With the shortest day of the year approaching (Dec 22nd) and the sun setting a little before 16:30 these days, its advisable more then ever to be carrying a headlamp for peace of mind. I did this today–March 14, 2018. The Floating Bridge is out, so I did the Murokubo Ridge trail. That was great. It is the most “natural” Japanese nature I’ve ever been in. Every other trail I’ve hiked is so improved and maintained that they often feel sterile. I really enjoyed hiking a mostly un-marked trail. The ridge made for good sightseeing on each side. The view of Fuji from Mito san was spectacular. The descent, through the Tomin no mori, was nice, but had the usual trail improvements that turn me off. I also saw considerably more people on that side. Snow and ice were hiding under leaves at the higher elevations. Kind of scary at times. I had a near impossible time orienting my map and the maps on the trail in the Tomin no mori to the terrain–or even to the street outside the tomin no mori. (For the life of me, I can’t/couldn’t figure out how you came out at Kazumashita.) I’ve been using 1:25,000 maps and am planning to find the Yama to Kogen maps and try them. From what I’ve seen, the graphics are much better. I exited the forest at the visitor’s center to find that the bus doesn’t run on weekdays until April! According to Google maps, there was no other way to the train but to walk. I started walking toward Itsukaichi, about 10 miles away. About 3.3 miles down the road, I was pleased to find out that the bus going by Kazumayu (onsen) was running. I had time for a bath before it came. That was great. Today was fun. I think if I do it again, I will definitely hike on the Lake Okutama side again. On the descent, I’ll avoid the Tomin no mori and take one of the other trails down. A longer one would be good. I spent more time on trains and buses today than I did hiking. Thanks for your detailed trip report Patrick. Nice to hear you enjoyed the Murokubo Ridge as it’s definitely the lesser used trail up to Mt. Mito. As you say on clear days the view from summit is pretty awesome. Another hiker mentioned the same difficulty locating the trail back to the Kazumakami bus stop. While the 1:25,000 maps are useful and I use them on my GPS they’re not overly hiker-centric with the location of bus routes and stops being a prime example. For the most part the Yama-to-Kogen maps are excellent and I recommend carrying one in either paper form or downloading it to your smartphone. Have you seen any of those maps for sale lately? I’ve looked around a bit but haven’t found them anywhere. I checked the one store in Akiruno listed on a web site as being a dealer and they’d never heard of them. I live near the outdoor park in Akishima and none of those camping stores carry them either. Personally I’ve never had a problem tracking down a copy. Most large bookshops seem to carry them. If you’re passing through Tachikawa they’re available from Ishi Sports and failing that you can buy them through Amazon Japan. They’re updated annually with the new editions available from around April each year.